Does anyone actually read those lengthy travel narratives in newspapers anymore? After all, travel features are really just a vanity in that the travel section is not written for you, the consumer, but for the advertisers who desperately need content on which to hang their product. This in turn funds the news part of the editorial mix – as Paul Bradshaw from the Online Journalism Blog reminds us in this Audioboo about the Times paywall. I’ve been wondering what kind of travel writing/journalism a reader might actually want to read, now that the advertising imperative is pretty much defunct and traditional travel supplements on their way out. As a consumer of travel writing, what do you actually want from a feature? Do you just read the first few pars of a lengthy travel article and then scan for the relevant bits? Or do you enjoy the poetic telling, wrapped up in a narrative, inside one particular (and privileged) writer’s experience? In the interests of experimenting, as is the will of this blog, I was interested to come across Len Kendall’s series of visual note sketches taken at SXSW Interactive this year, a festival I also attended and struggled to write up because of its enormity and huge downloads of information. Above are Len’s visual notes on how to take visual notes – or you can visit his Posterous if you want to see the whole sketchnotes series. I’m wondering if this could transfer to travel writing? After all, travel journalists are trained to observe, collect and note experiences on a destination. And The Times has already got in on the travel sketching act in the form of George Butler’s Sketch Travel Blog – of course, after June, the paywall means you won’t be able to see it, for free anyway. I have a trip coming up soon to Paris. If my hands aren’t dead from taking notes at the conference I’m attending, then I might attempt to do create visual notes rather than write up a feature. I imagine it will look kind of like an ‘essay plan’. We’ll see. Any further suggestions on how to ‘do’ travel writing differently, I love to hear ’em. 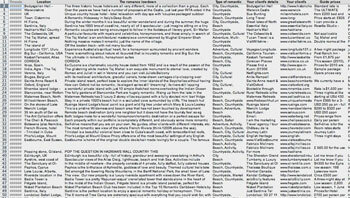 Posted on February 1, 2010 | Comments Off on Travel articles remixed? Could there be a trend for releasing journalistic research or unused data for others to ‘remix’ – as I suggested when I released the ‘behind the scenes’ source material for two of my online travel features? Digital journalists like Joanna Geary have bookmarked source material in Delicious and shared them at the end of their features for transparency. Meanwhile more and more people are uploading their research and original writings to Scribd. But reworking traditional journalistic product ? With a growing DIY culture online, why not. After writing up my ‘Behind the scenes of a travel feature‘ series and opening out the source material, I was interested to discover that I’m not the only one testing the water of transparent research with the additional invitation to create something new from it. We are providing unedited professionally filmed footage from the series, for you to use. This includes interviews, aerial shots, graphics and music. Download them for free under our permissive licence, and mix them with your own ingenuity. Each link below takes you to the Digital Revolution page that hosts the video. On that page, you can watch and – crucially – download the content to keep for your very own. No, really. So when I say ‘Steal This!’ in the headline, I mean it (obviously with caveats…). With this content, you can mix it up, mash it up, create your own story of the Web. More on that in a forthcoming post. For now, I will leave you with the goods. People share their creative endeavours with each other online all the time. It’s interesting that working journalists are now (finally?) doing the same. I’d love to know if anyone know any other examples of this, particularly in the travel genre. And I’m wondering could this be the start of a trend? What are its possibilities? What are its limitations? And how can we experiment with this stuff? Comments Off on Travel articles remixed? So how do you research a feature in the 21st century? The short answer is: In much the same way that journalists have always researched their features – by pulling ideas from their own head, asking colleagues, digging through cuttings, a good contacts book, and researching and phoning experts. But the variety of online tools, applications and networked communities should make it a) a lot faster, b) a lot easier, especially when it’s not your specialist subject (see pt 2: the commission). I’ll try to answer whether this was the case or not at the end. I keep an A-Z destination cuttings file of print articles and press kits but these were of no use for a themed feature. In this case, it’s easier to use a social bookmarking site like Digg or Delicious to find your keywords (‘romance’ ‘destinations’ etc). Here are some Delicious bookmarks for ‘romantic getaways’ (click to link through) – after all, why go searching for sites when someone else has probably already bookmarked them for you? I used this as a quick check to make sure I hadn’t forgotten to include a staple like the Taj Mahal. While there’s no copyright on ideas, it can be tempting to lift information from a good article but it’s just not worth it – more than three words in a row lifted from a source may land you in court and all it takes is for a sub-editor to paste your copy into a search engine and you’ll never be used again by the travel editor. For these features, I did use Google to help put flesh on the bones of the suggestions, and to find pictures, but best practice is to source information direct from official sites and tourist boards – such as info on Lover from the Visit Wiltshire website. Time to experiment! I’d seen a friend, @uktraveleditor, using Google Docs to source PR information and decided to give it a go – mainly because I wanted PR suggestions, package details and guide prices, but I mostly wanted to avoid an avalanche of marketing gumpf swamping my inbox – it was barely usable the last time I put a HARO alert out. The idea is that you send PRs to the online form (eg, via Travmedia, see above), set a deadline for responses, they fill in a Q&A that you set up, and the answers are then collated in a spreadsheet. You need a Google account but it’s pretty easy to set up from there. You can see I’ve included pitch details on there, who the commission is for, what it is NOT for (ie spamming or emailing), and asked some very specific questions not just to get relevant answers but to keep PRs from chancing their products. I also noted that I might be writing this up here. FYI, for any potential travel writers out there, this is how short and punchy you need to keep your pitches to editors, though perhaps with a couple of suggestions thrown in to illustrate your idea. Allaboutyou.com, which commissioned the features, is a portal for the readers of Good Housekeeping, Country Living, She, Prima, House Beautiful and Coast magazines. It has 470,000 unique users per month. It publishes some features from the magazine but also commissions fresh website content. Here are the two briefs from the travel editor. 1. Romantic places UK: top 10 most romantic places in the UK, the actual place, not a hotel so people can do a day trip/walk/pop in if they’re passing without spending £££ to stay the night. If it’s a spectacularly romantic place to stay in a romance-inducing place, that’s fine, or where the accommodation is synonymous with the destination. 2. Romantic places worldwide: top 10 most romantic places in the world. Can include loved-up accommodation as with this one, as people aren’t as likely to be passing. Include a where to stay, how to get there – whether it’s package tour operator or just flight details for a place, or accom details if accom. These 2 features aren’t necessarily a destination guide but more of a general romantic travel theme. Also can you supply a pic for each frame of the above 2 galleries – if PR shots are not suitable, source a ref no from one of our image libraries. As you can see, it’s a pretty open brief – so there was fun to be had with the theme –but there is also a heck of lot of detail work to do in finding an image to go with each blurb and also pin down prices, accommodations, travel details, etc. However, I had a cunning plan – to be blogged next in ‘tools of research’. Ever found yourself getting annoyed at massive omissions in a ‘best of’ list or wondered where they hell the writer has got their info from? Well, here’s a chance to go behind the scenes of a feature and see the writer’s process (well, mine,) as well as gain access to the original pool of journalistic research. The idea is that you can select your own ‘top tens’ rather than put up with mine – in effect you can rewrite the published end result if you so desire. You can also use the info as further reading for more ideas, it’s not in a writerly style but some people will like that. Or, more adventurously, if you’re a fellow travel writer/blogger, feel free to mine the data to put together a whole new travel feature altogether – just let me know what you create and I’ll link to it here on the blog. …is that they’re subjective. Recently I was asked to compile two gallery features for Allaboutyou.com: the most romantic places in the UK (below) and a global version of the same thing. So I decided to experiment – as is the will of the Tourist Vs Traveller blog – and crowd-source the answers using interactive tools and applications, but also funnel the suggestions into a one universally accessible place rather than swamping my email inbox and making it unusable. Cue 98 detailed PR responses in 48 hours, a large number of informal social media suggestions, and a spreadsheet that would take me eight hours to plough through. But before I unpack all of this travel feature’s baggage, and reveal the tools I used, here’s why I’m doing it and who I think might be interested. Why expose the guts of a story – and who cares anyway? • Curiosity – readers, who never see behind the scenes of travel writer’s job, may enjoy seeing how a feature was put together. • An exposé of journalism – people have come to distrust journalists because of spin/angles/pure lies. I think they would probably appreciate a bit more honesty, so here’s the guts of both features laid bare for anyone to see, review and make their own choices about. • Transparency and choice – there’s only so much information you can get into a feature but a helluva lot more collated research just going to waste – maybe the reader would like to see the full set of options rather than just the writer’s choice? Kind of like ‘Further reading’. • Skills sharing – print and non-techie web journalists can see some of the online tools available to them, and to know the pros and cons of using them. Techie types can also perhaps advise me of more tools I can have a play with. • Interaction – Crowd-sourced stories create a small community of contributors for that article and break down the barriers between journalist and readers. • Distribution – Those who contribute to a feature are more likely to follow the story’s trail to the end. They may also distribute it via sharing sites. Distribution is no longer via a newsagent’s shelf but via networks and communities and RSS feeds and the like, so journalists should have a interest in experimenting with crowd-sourcing. The other thing is that stories no longer die on publication but may come back to life again in the comments to form new stories – see the Online Journalism Blog for more this (eg the News Diamond structure for an online article). If there are any other reasons you can think of for making research transparent, let me know as these are just initial thoughts. I’m wondering also if there may be some risks involved in doing this, and has it been done before? I’ll be publishing the tools, results and social media stuff in future posts because this has suddenly grown into an epic. So time to wind up.